Many hands make light work, and we'd love to have you volunteer with us! 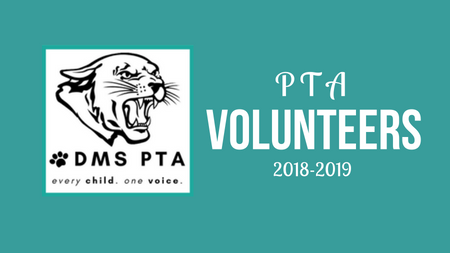 The PTA is powered by amazing volunteers who make a huge difference in the lives of each and every student at DMS! If you have volunteered before, we want you back, and if you haven't yet volunteered at Discovery, we have a job for you - no matter how much or little time you have to give! We have a huge variety of volunteer opportunities for you to choose from - including things you can do during school hours at DMS, and things you can do at night from home. You can choose what to do based on your interests and availability - just fill out the volunteer form indicating your volunteer preferences. We will then contact you as your requested opportunities arise. ​If you have any questions about volunteering, contact Karen Purser, VP of Volunteers. For school events & programs that are overnight, off-campus, or after school hours, all volunteers must participate in a mandatory background check. Click HERE to get started. ​This process can take up to 5-14 business days. Click the buttons below to sign up to help with upcoming DMS Programs & Events. ​Want to get involved but are unable to volunteer at DMS during the day? There are lots of school projects you can still help with from home! The DMS PTA need help providing much-needed supplies for classrooms. We have asked Teachers what items are needed on their Supply Wishlists, and will keep a runing list throughout the year. If you are able, please look through the Sign-Up for items that you would like to help provide for the classrooms. Note: Some Wish List requests require manpower, such as the painting projects. These would be great for students & families who need service hours. Thank you so much for donating your time, talents and/or treasure to help improve Discovery Middle School!